Yes, adults can do this, too. The mercury is pushing 90 this weekend with August-worthy humidity. 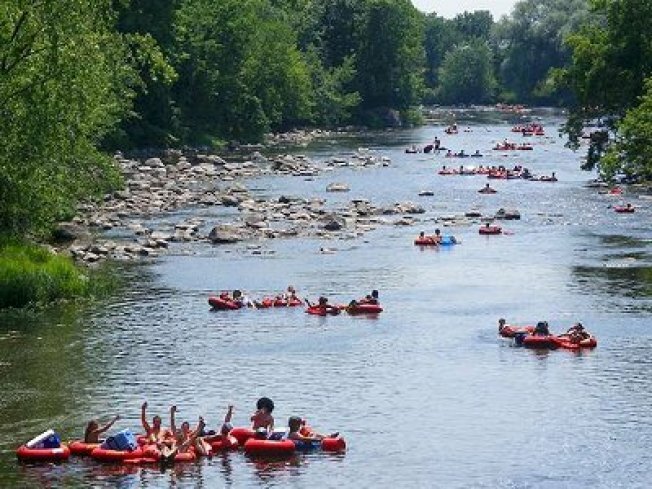 Instead of sweating it out in the city, why not spend a day drifting down the Delaware River? We know what you're thinking -- struggling to strap a kayak to the top of a double-parked Zip car while being honked at by angry cabbies takes all the leisure out of a leisure trip. Give me a Bloody Mary and a sidewalk cafe, you say. But this weekend all you have to do is show up at Port Authority with a bottle of sunscreen and that pair of aqua socks you've been dying to wear again. Urban Escapes, a company that makes it easy for public transportation-dependant city dwellers to see a bit of wilderness from time to time, is hosting two trips this weekend that combine two of summers best things: water and booze. On Sunday, paddle down the Delaware (the body of water that serves as a boundary between New Jersey and Pennsylvania) towards a vineyard in the Pocono Mountains, where a picnic lunch and private winetasting will be waiting. If you think a tall, cold IPA is better than a glass of rosé to end the day (and you don't mind getting wet), they have a trip for you, too. Satuday, a day on an inner tube ends with a trip to a local brewery where you'll get a tour and yes, a glass of beer. Both trips will get you back in the city just in time for sundown. Reserve your spot here.